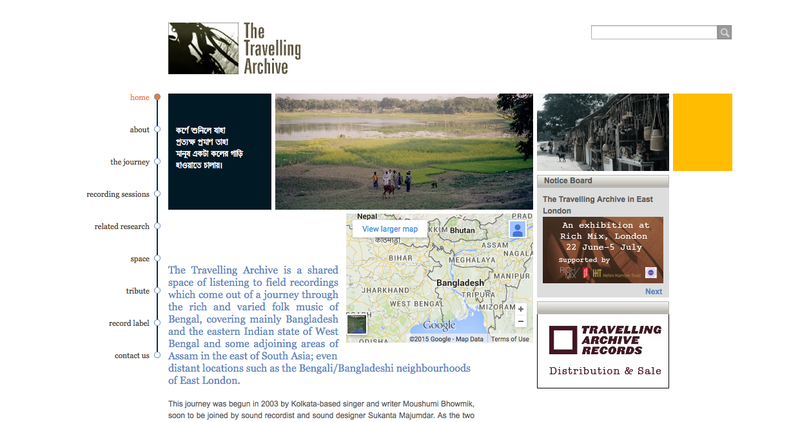 Was back to looking at sound and found this amazing project called The Travelling Archive. It was started in 2003 by Moushumi Bhowmik a singer and writer based in Kolkata as a collaboration with Sukanta Majumdar, a sound recordist and sound designer. Together they have been touring Bengal – including Bangladesh, West Bengal, Assam exploring, listening and recording the sounds of folk music. Their website is a great resource holding within it field recordings as well as documentation of their journey and what making this archive means. It is quite rare to come across a website that holds so much of the process. Great work! This entry was posted in Art, Global South, Sound and tagged Archive, Bangladesh, Bengal, field recordings, Folk music, India, Mapping on August 11, 2015 by Rashmi Munikempanna. I think what really interests me is the use of what has been traditionally seen within the ambit of craft, of women’s labour, of the personal here used to draw the map of a city. In a way you end up navigating a city through an activity that is very much singular, a gesture that holds within itself notions of nurturing, of healing, of caring and within a public space. In the images that document this activity with a before and after the event, the stitching up is never meant to be hidden like in darning but a very visible sewing up holding within that stitch the tear as well. This entry was posted in Art, Images and tagged Art, Bogota, Columbian Art, Feminism, Mapping, Photography, Urban Studies on October 7, 2013 by Rashmi Munikempanna.